There’s no right or wrong way to declutter. As long as you get stuff out, you’re winning. That’s what I’m talking about today, specifically how strategies to deal with roadblocks are necessary, even though they aren’t necessarily the all-the-time strategies I use. Sorry for the late release! My internet was completely down so I couldn’t get it uploaded. That isn’t the only tech problem, as you’ll hear. I finally gave in and ordered another microphone, so next week’s podcast should sound better. It’s so frustrating to not remember the super-logical-I’m-sure place where I stuck my microphone to keep it safe over the summer break and during remodeling. Ugh. Sponsor: Handy.com – Get your first 3-hour cleaning for $39 when you sign up for a plan, visit handy.com/slob and use promo code SLOB… during checkout! Recurring charge terms and conditions apply, visit Handy.com to learn more. Just read your book. Great advice. Your books and videos have helped me so much!! I really understand now why I cannot keep up with my house. I am putting your principles into practice and slowly starting to see real progress! Thank you so much for sharing your insights and can I say you do it with entertaining humor too! I just love you and watch them over and over. Thanks for this episode! I was listening while doing dishes, laundry, and some decluttering as I went. I, too, am a recovering slob but in the beginning stages of my recovery haha. Because of this episode I have my very own “comforter story” (albeit far less sentimental). I was folding towels and came to a microfiber hair turban from the dollar store. I have a nice, thick, full-size one that I use every time I shampoo that I’ve now decided lives on the hook next to the shower. So I came to the crappy, smaller, cheap turban and thought about putting it in the donate box right when you were explaining how it’s possible to change the purpose of an item without it being an excuse just to keep it. Then it hit me – this smaller, cheap turban would be great to hang with my dog’s leash on the hook by the door to wipe his paws when we come in from the rain. I never have a towel for that purpose right by the door when I need it, and this turban is perfect to hang right there! So – thank you! Here’s a clothing question. I have a camisole tank top that only really works with one sweater (it has a built in shelf bra that I don’t LOVE) but it really is perfect with my nice navy sweater. I don’t have another cami that works with this particular sweater. Is that enough of a reason to keep it? It’s in good shape and is a nice brand. @Kate W Cole I would keep the cami if you wear the sweater. You can even store them together, like if you fold the sweater to store it, fold the cami and tuck it between the folds of the sweater. If you hang the sweater over the horizontal bar of a hanger, hang the cami as well. If for some reason you lose interest in the sweater and won’t use the cami, just donate both. I’ve read many decluttering books. 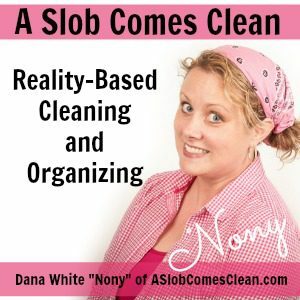 Like you, I began years ago with trying to “organize” instead of decluttering, which of course never worked. Examples were “organizing” 50 Post-It notepads when I used maybe two Post-Its a year; owning 15 pencils when I only write with a pen, owning 15 pairs of workout leggings when I wore the same two pairs over and over, etc. Your method was the one that stuck in terms of being workable on a daily basis and not becoming overwhelmed. I’ve taken suggestions from other authors but nobody has gotten to the heart of it like you did – when you wrote “declutter for visibility” it was like everything changed for me. It’s such a game changer to use this strategy when you’re a person who is paralyzed from clutter and as a result won’t or can’t let people come over. It changed everything for me. I actually started at my front door. I went outside and walked back in and started at the front of the house and worked my way to the back. What do people see when they first walk in? Oh, yes, those ridiculous baskets filled with books and shoes. How “attractive” and “welcoming” that must be! Stepping around those must be fun for guests. I donated all of my baskets. I also broke my rooms up into grids like 4-5 square feet per grid and worked only on one “grid” until it was the way I wanted it. My daily tasks include dishes, sweeping, making the bed, wiping down the window ledges where the squirrels eat, putting away clothing and any books I pull off shelves and use during the day. My goal every day is that the house is presentable enough that if someone knocked on my door at 8 a.m. the next morning, I could let them in without having to do a thing. Given my penchant for re-cluttering happening practically while I sleep, I moved more towards the minimalist end of owning very little. Between your strategies and owning very very few items, my life has been transformed. Thank you for helping me de-slob!